Disclaimer: You may have noticed some incongruity between posts and pictures. In the rush between returning to Rome from Assisi on Epiphany, and Nancy leaving for the states the next day, I did not have time to download our pics and videos from that part of the trip! So, I have had to make use of others’ photos. This is why the “Rainy Assisi” pics have blue skies! The train station for Assisi is on the valley floor, in the “new” town called Santa Maria degli Angeli, after the church there – though still in the municipal limits of Assisi. The Basilica of Santa Maria degli Angeli (St. Mary, [Queen] of the Angels) is constructed over the small chapel that Francis rebuilt in response to his vision of the San Damiano crucifix which told him to repair the Lords house which was falling into ruin. He thought it meant the small deteriorating chapel below the town, on some unused property of one of the local monasteries. Only later did he realize the Lord was probably not being so literal, and meant to reform the Church itself. It is easy to forget that the Reformations really started about 300 years before Luther! Here in Rome there is a statue outside of the Lateran of St. Francis and companions pleading their case before Pope Innocent III, who, according to pious legend, had a dream of Francis supporting a tilting church and interpreted it to mean he would help sustain the Church from collapse. The small chapel that he rebuilt, and the portion of land it is on, are known as the Porzincola – the small portion. 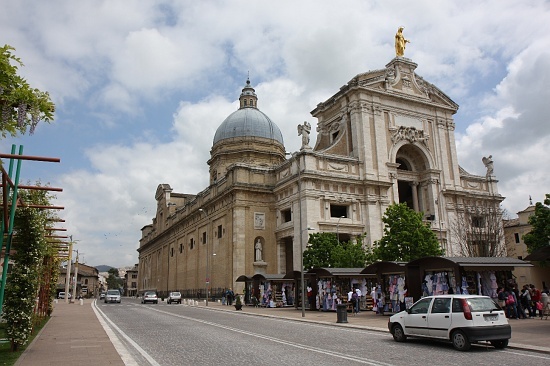 After his death, they literally built the new basilica over his little chapel, which is still intact in the centre of the new church. It is not hard to imagine what he would say of this huge “memorial” to his humble little house of the people of God! For those of us from the States, especially on the west coast, it is important to remember the history of Franciscan missionaries who brought their Assisi roots to California’s shores. 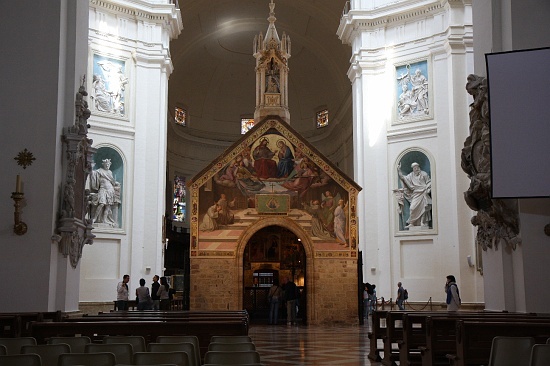 Three of their many missions were named after churches here in Assisi: Santa Chiara inspired Santa Clara, San Francesco inspired San Francisco, and Francis’ Porzincola inspired the name of a little place – El Pueblo de Nuestra Señora la Reina de los Angeles del Río de Porciúncula – more commonly known as L.A.
By A.J. Boyd in La vita Roma on January 6, 2010 .